February 10, 2016 – Black hole enthusiasts, galaxy cluster aficionados, and X-ray astronomers have much to be excited about. 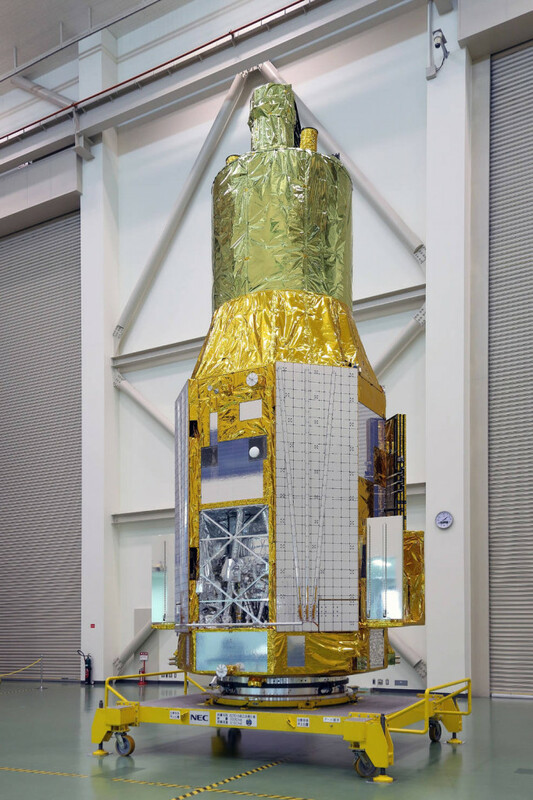 On Friday, February 12, the Japan Aerospace Exploration Agency (JAXA) will be launching their sixth satellite dedicated to X-ray astronomy, ASTRO-H, from the Tanegashima Space Center in Kagoshima, Japan. The observatory carries a state-of-the-art instrument and two telescope mirrors built at NASA’s Goddard Space Flight Center in Greenbelt, Maryland. The launch is scheduled at 3 a.m. EST. ASTRO-H is expected to provide breakthroughs in a wide variety of high-energy phenomena in the cosmos, ranging from the superheated material on the brink of falling into a black hole to the evolution of vast galaxy clusters. 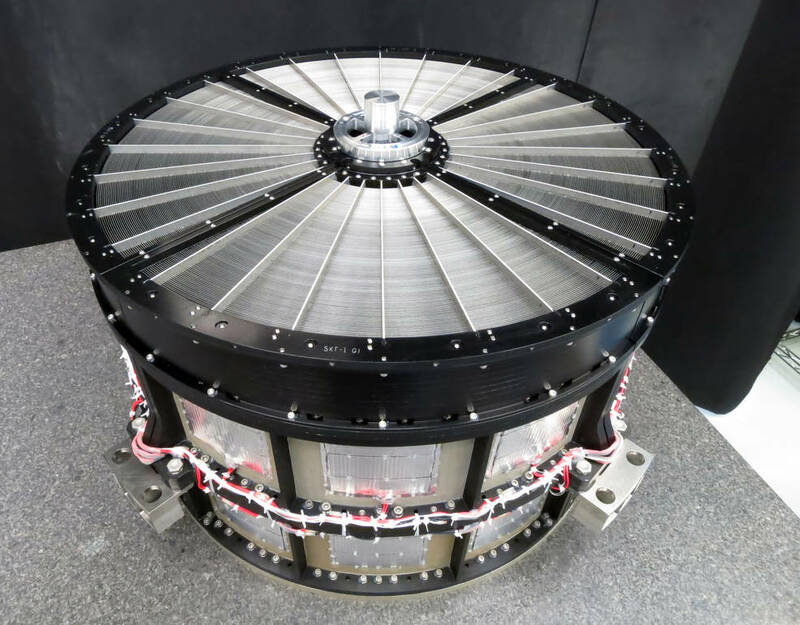 It is equipped with four advanced instruments covering a broad energy range, from low-energy, or “soft,” X-rays around 300 electron volts (eV) to soft gamma rays up to 600,000 eV. For comparison, the energy of visible light spans about 2 to 3 eV. ASTRO-H is capable of observing X-ray sources, like galaxy clusters and neutron stars, more than 10 times fainter than its predecessor, Suzaku, which operated from 2005 to 2015. To achieve this, ASTRO-H uses four co-aligned focusing X-ray telescopes and a suite of cutting-edge instruments that provide simultaneous coverage across the observatory’s entire energy range. Two identical Soft X-ray Telescopes include mirror assemblies provided by the Goddard team. Because X-rays can penetrate matter, the mirrors rely on what scientists refer to as grazing incidence optics. Much like skipping a stone across water, X-ray light skimming the surface of curved mirror segments is deflected toward the telescope’s focal point. One Soft X-ray Telescope focuses light onto an advanced wide-field camera provided by Japan, while the other directs it into the Soft X-ray Spectrometer (SXS), an instrument developed and built by the Goddard team working closely with colleagues from several institutions in Japan. Astronomers typically learn about the composition, temperature and motions of cosmic sources by spreading out the wavelengths of light into a rainbow-like spectrum. But astrophysicists have devised an alternative approach for measuring X-ray “colors,” called microcalorimetry, that produces unprecedented spectral resolution without diluting their intensity as happens in previously employed approaches. Researchers in the U.S. pioneered the development of this revolutionary technology in the 1980s. 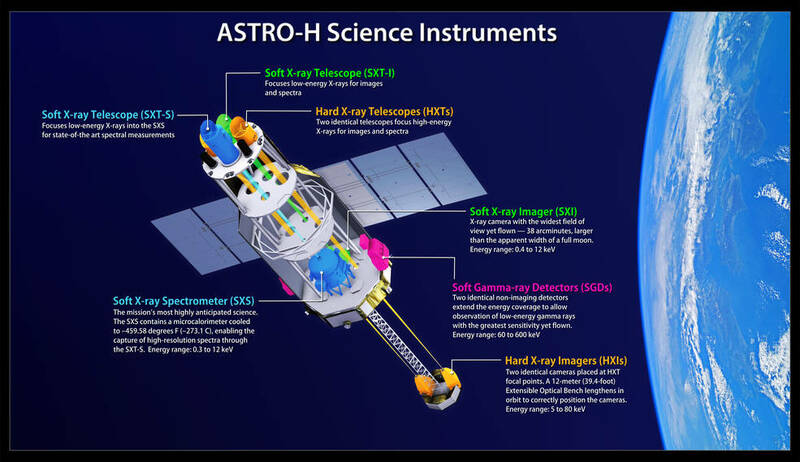 ASTRO-H will provide astrophysicists with the first opportunity to use it on an orbiting X-ray observatory. 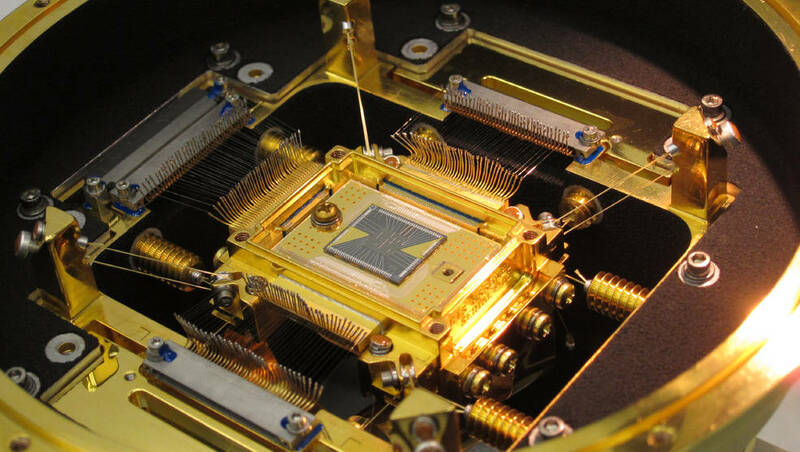 The SXS measures the heat generated when individual particles of light, called photons, strike the detector. The SXS precisely determines the energy of individual X-ray photons by measuring the small temperature increase made by each one. Because the changes are so small, the detector is cooled to -459.58 degrees Fahrenheit (-273.1 C) — a fraction of a degree above absolute zero — using a system developed in Japan and the U.S. Thanks to a series of nested vacuum containers called dewars, a supply of supercold liquid helium, and a sequence of mechanical and magnetic refrigerators, the SXS is expected to keep its cool for more than three years. “The technology used in the SXS is leading the way to the next generation of imaging X-ray spectrometers, which will be able to distinguish tens of thousands of X-ray colors while capturing sharp images at the same time,” said Caroline Kilbourne, a member of the Goddard SXS team. The observatory also carries two identical Hard X-ray Telescopes and their associated cameras, which image light from 5,000 to 80,000 eV, and two Soft Gamma-ray Detectors, which are sensitive to light from 60,000 to 600,000 eV but do not produce images. Both the telescopes and the instruments were provided by Japan. ASTRO-H was developed by the Institute of Space and Astronautical Science, a division of JAXA. It was built jointly by an international collaboration led by JAXA, with contributions from NASA Goddard and other institutions in Japan, Canada and Europe. Additional Goddard responsibilities included development of the analysis software and data processing pipeline and creation of a facility to support a vigorous guest observer program enabling the participation of the broader U.S. science community in the mission.